Making the rounds in social networking has been this wonderful post titled, “This is What Happens when you Give Thousands of Stickers to Thousands of Kids.” from Colossal. This post shares the wonderful artwork called, “The Obliteration Room.” If you haven’t taken a look at their sticker dot covered white room yet, it is worth a quick peek! Dot Stickers! are available at Amazon too! Thanks! I have giant post-it easel chart paper. I’m going to pick up some of these stickers this weekend and turn my 3 year old loose! She’ll love it! I hope she has fun sticking dots! I just absolutely <3 <3 <3 THIS! You’ve got the wheels turning in my head with lots of ideas for how to use sticker dots. Thank you for sharing the art installation. It is inspiring! I love it when wheels are turning! We also did this this week as part of Seuss celebrations. 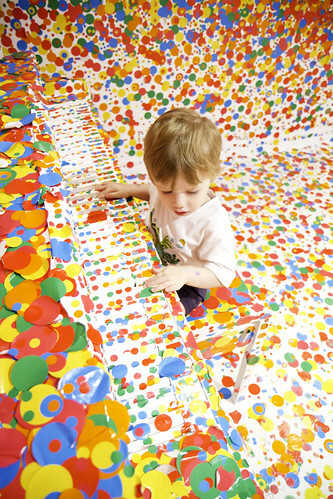 Then on Friday I found the book “Lots of Dots” – wonderful book. I gave each child stickers to take home and create. What a wonderful gift to extend the process at home! We love lots of dots book! Love the stickers and the activity! Were did you get the dot stickers? It is worth doing for sure Kim! We loved it! What a beautiful idea! I can’t wait to try it in my classroom. My kids have read the book Press Here before too and just love it. That is one of my favorite books!